Junk food can be tempting. It is quick, convenient and due to the high number of additives, it can taste very good. But when we actually stop and think about what we are putting into our bodies, we may be very shocked indeed. A recent report has suggested that some donor kebabs could contain as much as half our daily calories intake, with one kebab tested containing a massive 2,000 calories – the daily calories limit for a woman. What's more, it is not just the calories count. The salt and fat content is junk food is massive. But never fear, for there are healthy versions available to make, of almost all junk foods, which can actually improve a healthy eating lifestyle and even save you money. Burgers are one of the most commonly consumed junk foods. Burger outlets are on every High Street in the country. But before you sink your teeth into that high fat, high salt burger, think how easy it would be to make your own – not to mention fun. All you need is some good quality mince and an egg to bind it together. The really great thing about making your own burgers is that you can season them to your own preference. A little onion in the burgers is usually a big hit, and if you like things spicy, then why not chop a chilli and add that too? You could also try cumin, coriander, in fact, anything which takes your fancy. If you like Thai food, add lemongrass. If you like Indian, then a little garam masala. The choices are endless. Serve with fresh salad and a tomato salsa and you have a healthy meal. After a busy day at work, what could be easier than popping to the Chinese takeaway? But when you think of how many calories you are consuming, how much sugar and salt goes into the meals and how much they cost, you should think twice. A homemade stir fry is one of the healthiest meals you can prepare. You can throw in all types of vegetables, a little chicken, even beef or pork, and a splash of soy sauce and you have the basis for a very tasty and healthy meal instead – and one which barely takes longer than waiting at the takeaway. It is well-documented how much our nation loves curry. But the curry dishes we order from many takeaways bear little resemblance to the curries made in India. Far better results will come from making your own. In addition, if you make your own, you can be sure there are no additives in the sauce and that the meat is good quality and the cuts you want. Serve your curry with boiled rice and you have a healthy version which tastes better than those from the takeaway. Pizza, beloved of youngsters and people on the run. It is an easy option, to be sure. But how many people know how easy it is to make their own? Pizza dough is not hard to make, and once the base has been created, it is possible for the cook to top it with whatever they like. Good quality cheese, rather than liberal helping of processed cheddar and tomato puree form the basis for the toppings but then the sky is the limit. 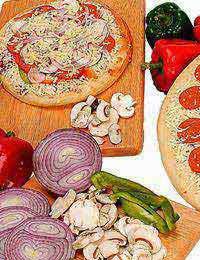 It can be a handy way of getting vegetables in children, as you can use up all sorts of vegetables on the pizza. Add to this the fact that pizzas are a great way to use veg about to be thrown out and the junk food alternative becomes a healthy and money saving alternative.